I was dismayed by this answer, for I knew the first of those things to be patently untrue. I could not go anywhere – let alone everywhere – with such certitude. With such denial. As for the second thing, even in callow moments when it has been true, when it has felt as though my heart was an ever-expanding galaxy, that feeling too has sometimes proved irretrievable. Although I will concede that to love is never for nought, not entirely. Many years since that conversation, as I packed once more to go to several somewheres with neither of the two expectations I was advised to always carry, it suddenly hit me: maybe it had only been his phrasing that I had not been able to relate to. When all along, the deeper truth of his statement was not so elusive. Because what I know to be true is this: only in the presence of a specific kind of love, self-love, does the self-aware person seek to be loved by another. And in the absence of self-love, the self-aware person knows better – sometimes through conscious empathy, and sometimes through instinct – than to inflict their need on another. Therefore, perhaps what that advice had really meant was this: “I love myself, and so I am certain that this will be unchanged no matter who I encounter. I greet them as if we love each other already, because there is no risk.” At least, that is my interpretation, now, for that strange answer. That its application fundamentally rests on a prerequisite: pre-existing, even permanent, love for oneself. Now that, no one has ever taught me how to have. But I have spent my whole adult life trying to teach myself, going over lessons again and again like a student held back year after year. My capacity for love has greatly diminished, but my enquiry into it is stronger than ever. I write to you from high on a mountain, surrounded by verdure, but my thoughts are on a potted hibiscus that may not be watered in my absence. This plant suffered a fungal infection, after which I’d left it for dead, but without the will to uproot it. Left untended for a week, in the absence of hope and nourishment, it suddenly began to sprout the tiniest green leaves. This is how I last saw it: tenacious even if not thriving. But I went into and will come down from the mountains with no expectations at all, only to learn a little more – from anything that will teach me. An edited version appeared in The New Indian Express on March 8th 2018. “The Venus Flytrap” appears on Thursdays in Chennai’s City Express supplement. You lay on your back on the leaf-layered earth and see the sky rivered blue between patchworks of green. Crown shyness: the reluctance of certain species of trees to touch at their heights, so the canopy is a really a configuration of boundaries. The limit at which something is withheld. We don’t know why those trees do it any more than we know why we behave in our own mysterious ways, at odds with our natures. What’s the worst thing that can happen if your fronds or your fingers linked? What abrasion could be so injurious that what you will lose in the wind anyway cannot be risked? What larvae more fearsome than the way regret eats at you from the inside? It is not difficult to go so long, crown-shy, tracing but not trespassing borders. It is more difficult by far to begin to make the reach again, to remember how to unfurl into a close but forbidden expanse. Forgets self-preservation. Forgets uprooting and decay. Forgets the sky itself. Somewhere, on a farther continent, is a wolf tree, disorderly in its bearing, thriving on too much sunlight and too much space. The wolf tree is the one that was the last one standing, the one left for pity or prettiness while around it axes made way for pastoral land, the one that survived fire or pestilence. Without restriction, its branches shoot forward, devouring all available nutrients: light, moisture, soil, air. It is no longer necessary to reach only toward the sky, hemmed in by the needs of other foliage. So it throws its wooden limbs forth like some form of medieval punishment, protuberant boughs in too many directions at once. They grow horizontally, low on the ground, forking like snake-tongues or strikes of lightning, which have splintered it often. Its crown too is wide, ever-increasing – and un-neighboured, never-encroaching. A century can pass. Around it, fresh verdure finds cultivation, flourishing just beyond its shade. And then the wolf tree begins to recede – no longer as abundantly nourished, a plethora of resources at its personal disposal. It does not die, but looks like it will, or – if a being as venerable as a tree can be assigned so shamefully human a trait – that it wants to. It isn’t so easy now, to be so crowded in, to be so damn obvious a testament to having withstood the damage of many seasons of solitude. Gnarled into glory. What can anything be, anew, having already been the only thing it will be known or remembered to ever have been? “There’s a reason why it hasn’t happened for me in so long,” you say. “And that will not be explained by these metaphors, or by your idea that you can explain it.” You let the shadows envelope you. You know it’s not clear from the outside what has happened: if many crowns have collided, or if only a single canopy blots out the sun. An edited version appeared in The New Indian Express on August 31st 2017. “The Venus Flytrap” appears on Thursdays in Chennai’s City Express supplement. My story on looking for quiet places to read my new manuscript in the Western Ghats of Tamil Nadu and Kerala, featuring an elephant surprise, is in Condé Nast Traveller India. You can read it here. Sometimes the forest stretches her limbs, lets loose her hair so its tendrils unfurl – a little like territory flags, but those are human contrivances – into the places in our lives where we have forgotten her. She reminds us. She asks that we watch, and that we listen for her. On certain city roads, there is an even keen of insect sounds that surrounds us for exactly as long as we ride under an arbour of embracing branches. Then we re-enter the sunlight and that forest essence vanishes. Do you hold your breath under that canopy cover? Do you slow down? So I both wonder and don’t have to wonder what he’s thinking, the leopard who was caught in a Bengaluru school last week. He was tranquilised and captured, and has since fled his cage again. He is at loose in the Bannerghatta National Park, his habitat, as I write this. It takes only minimal empathy to imagine why he might abhor his cell. Around the city, there other sightings. What could they be: tricks of the eye, wishful mirages, or truly: animals of the wild, wandering? The forest seeps into civilisation in ways brutal and beautiful. Sometimes, both at once. In Munnar, mountain elephants stumble onto highways, lumber into jeeps and onto people. In the Sundarbans, tigers whose ecosystems are ravaged by natural upheaval seek human meat. Meanwhile, at the BRT Tiger Reserve in Karnataka, where Soligas live alongside them as per longstanding tradition, the tiger population doubled between 2010 and 2014, and no animal-people conflicts occurred. In times of disaster, there are rumours circulated about beasts escaping captivity: about disintegrated walls at Vandalur Zoo during the recent floods, for instance. Tell me who among these is most brutal: the lost one, the lacking one, or the liar? So one reads about these leopards, at a safe distance admittedly, and watches and wonders a little more. Sometimes, I sit with people and sense the sea in them calling. Or the mountains, or the starlight. Or once in a while, in the aura of a particularly battle-weary individual, the desert. Most of all, though, it’s the sea – biologically, our bodies are made almost entirely of water. A sun-kissed beach and a cliff-jagged coast will each offer a different conversation, but it is nourishment just the same. The forest calls to me often, and even if I no longer chase its song, I know its resonance. Amidst the vehicle horns of the city and its bandage of artificial light, I seek it. And in doing so, invoke it. I am waiting for April, when a particular jacaranda tree will empurple my daily route. I am waiting for a dark crow taking shelter among tamarind pods on a day of rain. But most of all, I am waiting for escape: for the helix of a montane highway, for the bite of clear cold air, for a place where I can sink my feet into the lush red earth and know it to be a homecoming. An edited version appeared in The New Indian Express on February 18th. “The Venus Flytrap” appears on Thursdays in Chennai’s City Express supplement. As we were speaking, someone came in looking for a knife. VP, as she was known, would not pass it by hand. “I don’t want us to fight”, she said, smilingly. I admired her so deeply, and so simply, that I adopted the superstition immediately. VP died on November 30th 2014, at 67 years old. 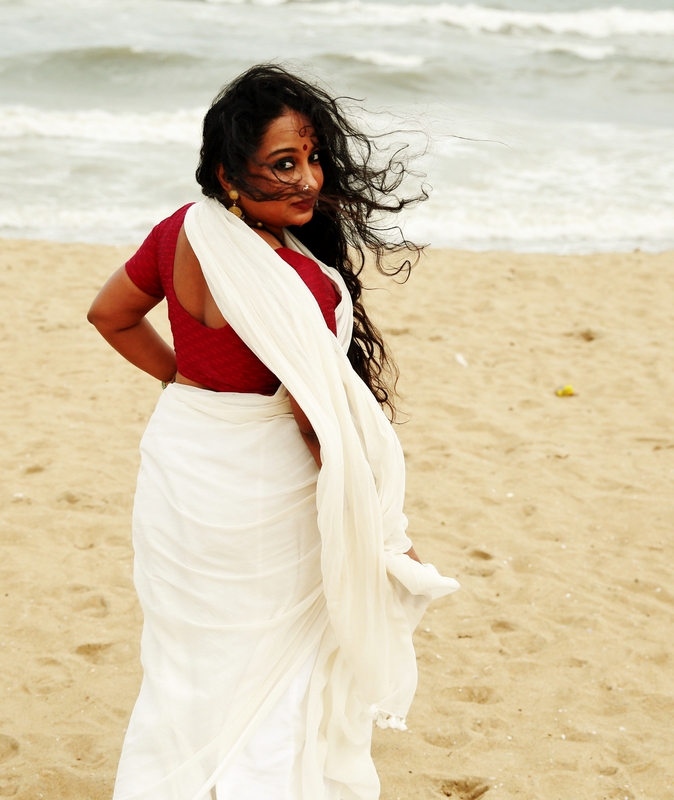 She was an artistic pioneer who immersed herself in everything from chhau, kalaripayattu and koodiyattam to western dramaturgy, and dispersed equal energy into developing new work, questing, teaching, and creating and maintaining the magical Adishakti campus. “There is no one like Veenapani Chawla in Indian theatre. There is no other group like her Adishakti – certainly there hasn’t been any since what we call ‘Modern Indian Theatre’ began,” wrote Girish Karnad a few months before her passing. I met many who envied her. But I met so many more who loved her. She was extraordinarily powerful, and equally kind. I had come into her orbit by chance, and stayed in it because of her generosity. The first time I went to Adishakti, I stayed for a month. I would take my slippers off and dig my feet into the cool earth as though I could shoot out roots, and weep. It was a primal connection. This was where I came to understand intimately that what society calls a fringe is what the psyche knows as a frontier. It was not until a few years later that I found out that my paternal ancestral temple was only twenty minutes away. It had not been an imagined bond between my blood, my bones, those pepper vines, that soil. I am not a theatre artist. I was not trained in the pedagogy for which Adishakti is famous, developed over decades of intensive research and dedication, and given away to all who wanted to learn it. I never studied performance under VP. I never even learnt how to swim from her – an offer she made me each time I saw her going for her laps in the huge, mineralised pool built on the campus a few years ago. Most of what I learnt from her, though, was intangible – both in its transmission and its nature. Veenapani Chawla was a singular influence on me. Meeting her permanently changed the trajectory of my life. I am who I am at 30 only because I met her at 23. Why I still live in India, why I never married, why I gravitate toward grace and quietude over militancy and glitz – the answers to all of these questions are linked to having known Adishakti and its founder, and having been indelibly transformed by both. How could so much transpire on the basis of one soft-spoken woman and her home of red earth and verdure? Simple. Above all, knowing Veenapani Chawla taught me that another way, another paradigm, is possible. That one can live a life with devotion at its core: to art, to divinity, and to community. An edited version appeared in The New Indian Express on November 30th. “The Venus Flytrap” appears on Mondays in Chennai’s City Express supplement. It’s called “Ghazal of the Cooum”, and you can read it here.